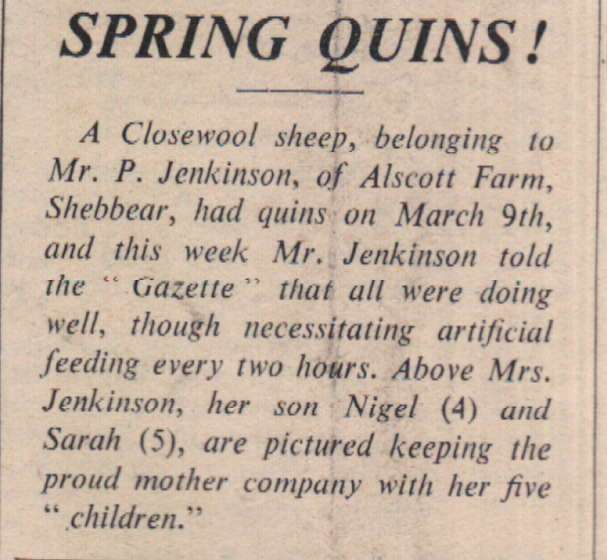 A Closewool sheep belonging to Mr P Jenkinson of Alscott Farm, Shebbear, had quins on March 9th, and this week Mr Jenkinson told the Gazette that all were doing well, though necessitating artificial feeding every two hours. 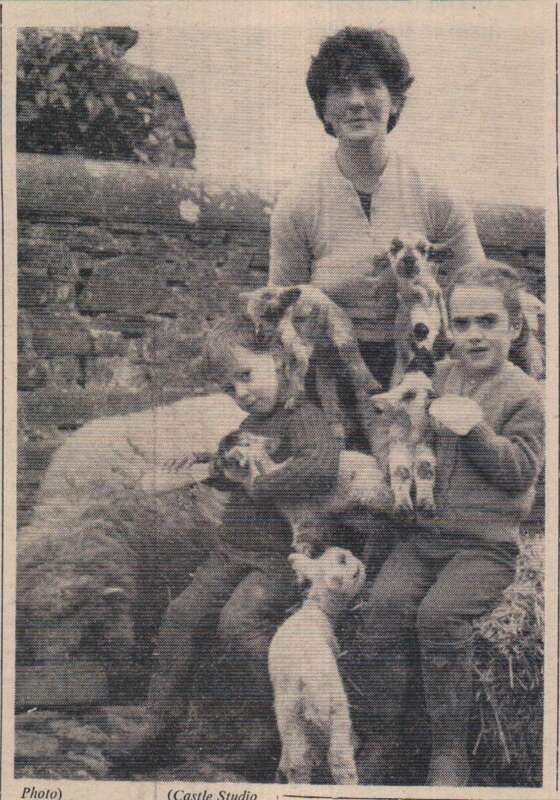 Mrs Jenkinson, Nigel and Sarah, are pictured keeping the proud mother company with her five children. 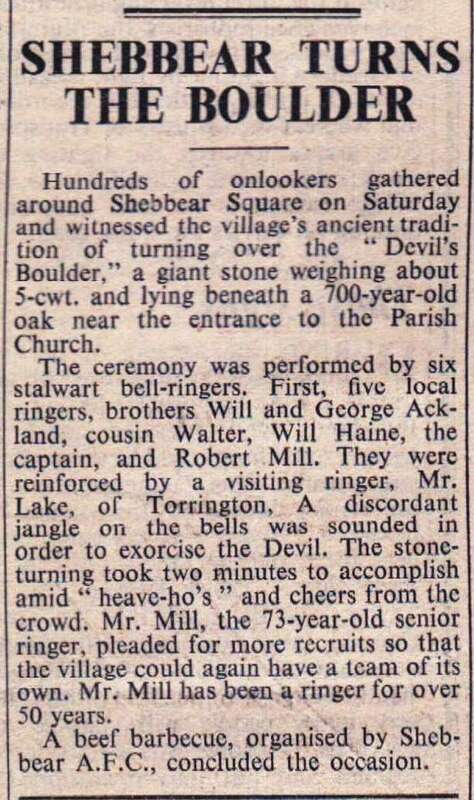 Every years 'since the mind of man runneth not to the contrary' the village bellringers have ensured that the Devil is driven from the district. 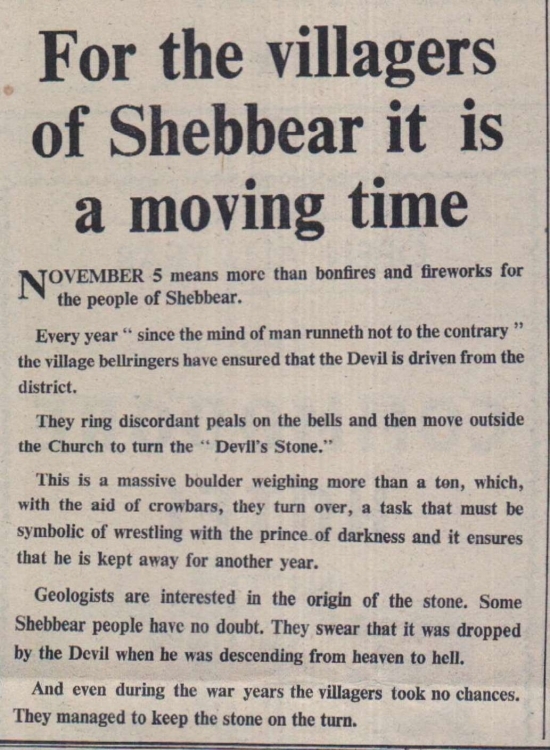 They ring discordant peals on the bells and then move outside the Church to turn the 'Devil's Stone'. This is a massive boulder weighing more than a ton, which, with the aid of crowbards, they turn over, a task that must be symbolic of wrestling with the prince of darkness and it ensures that he is kept away for another year. Hundreds of onlookers gathered around Shebbear Square on Saturday and witnessed the village's ancient tradition of turning over the "Devil's Boulder", a giant stone weighing about 5-cwt and lying beneath a 700-year-old oak near the entrance to the Parish Church. 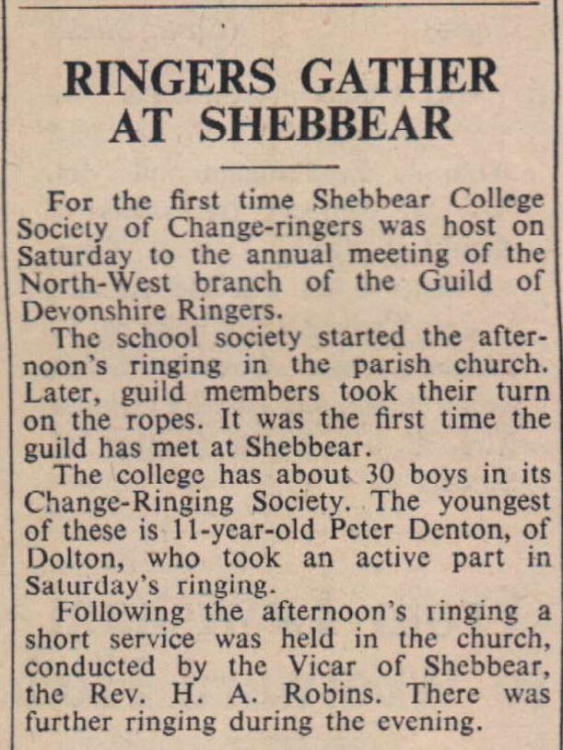 For the first time Shebbear College Society of Change-ringers was host on Saturday to the annual meeting of the North-West branch of the Guild of Devonshire Ringers. The school society started the afternoon’s ringing in the parish church. Later, guild members took their turn on the ropes. There would seem to be ample land for housing available within the village of Shebbear to meet general needs, say Department of the Environment inspector Mr W R Arnold. A 31-year-old Shebbear mother learned from the Gazette this week that the Royal Humane Society is to present her with an award. Mrs Jennifer Moast, of Battle Down, Shebbear, had not heard officially of the award when the Gazette telephoned her with the news. Capt S Gorrell, of Northam, who brought to the notice of the authorities Mrs Moast’s action, was given news of the award in a letter from the Royal Humane Society. Known as Sceaft Beara in 1050 and Sepesberia in the Domesday Book, Shebbear has had its name spelt in at least seven different ways over the centuries. Devon County Council have found yet another variation for 1974! Mrs Nankivell, wife of Mr John Nankivell, President of Shebbear Young Farmers’ Club, cut a cake decorated with 21 candles at a dinner held in Buckleigh Filleigh Parish Hall to mark the ‘coming-of-age’ of the club.